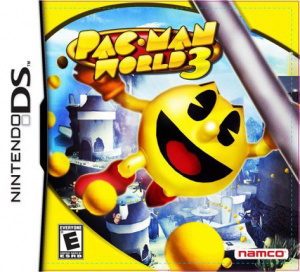 Sorry, no review of Pac-Man World 3 yet. Celebrate Pac-Man's 25th anniversary with the latest in the popular series, Pac-Man World™ 3! In a mad search for power, evil genius Erwin creates a machine that can penetrate into the world of the Ghosts... the Spectral Realm! But now the Spectral Realm is collapsing into the real world, and this will bring about a massive catastrophe that will plunge the world into a state of devastation for years to come! After mysteriously having been transported out of Pac-Village and into this strange and different land, it is up to Pac-Man to uncover Erwin's plot and save the world. Along the way, Pac-Man will meet a host of unexpected "old friends," and in order to defeat the ultimate enemy, he might just have to turn his old foes into allies! New story puts Pac-Man into a strange new world, leading him to the mysterious Spectral Realm. Includes the original Pac-Man arcade game from 1980!